Aug. 26, 2017 - PRLog -- Introducing the Spiritual Satanist newsletter, brought to you by SpiritualSatanist.com. This is the first time that they have released a newsletter, so to introduce this new service to friends and fans, they are also running a contest. 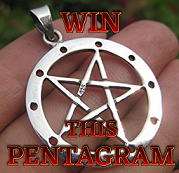 Each person who enters the contest has a chance to win a beautiful sterling silver pentagram. One lucky winner will be chosen on Halloween night, 2017. The Spiritual Satanist Newsletter is the first of its kind. It covers all of the creative projects produced by Venus Satanas and it's the best way to stay up to date on what's happening in Satanism. Full details on the Spiritual Satanist Newsletter, and Contest rules are availabe at the Spiritual Satanist website.